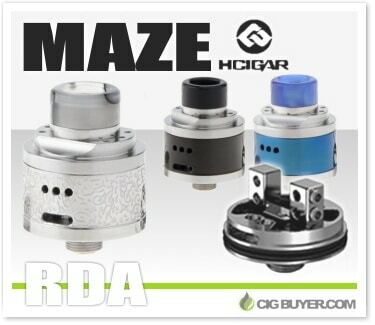 The HCigar Maze RDA is a compact 22mm rebuildable dripper with an ample two post build deck and dual adjustable airflow control. At only 18mm in height (25mm with threaded resin drip tip), it’s surprisingly small and features quad 2mm terminal holes with a deep 5mm juice well. The deck is fed by two large 3mm airholes per side, with adjustable airflow control on both the side and bottom of the deck – giving you complete control. Its made out of quality 316 SS and includes a gold-plated 510 connection.